We are Mark and Renee'. We have been married 24.5 years. We have four children: three biological 18 year-olds and an adopted 5 year-old son, Ian. After adopting Ian in 2014, we honestly thought we were done growing our family. We were both close to turning 50 and had started child-raising all over again with a special needs child. Since Ian came home with us, he has made so much progress and continues to amaze us how he is thriving. 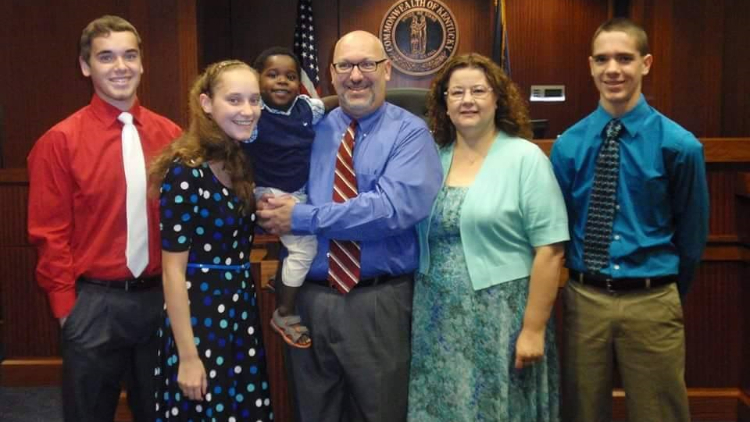 Earlier this year we learned of a child needing a forever family. We learned of this at the same time, but neither one of us mentioned it to the other at the time. We later discovered that God had been moving in both of us that we needed to adopt again, and this was the child. Soon after accepting the referral of this child, we learned of another child also in need of a forever family. When presented with this 2nd referral, neither of us hesitated in agreeing that we were being led to adopt 2 children. In the span of a month, we went from thinking our family was complete to beginning the process of adopting two more children. As you may know, international adoption comes with many expenses. To date we've had a yard sale, with others to follow, to raise funds; we've had a t-shirt fundraiser; have applied for several adoption grants, and plan to apply for several more. Not knowing exactly how this adoption process would go, we stepped out on faith that God will provide throughout the process. We ask for your prayers as we embark on this journey, and if you feel led to be a part of our adoption through giving to help offset the costs, we would be forever grateful. Donations will go directly to our adoption agency to pay fees or offset expenses. Inspired by your sacrifices so that Ruth and Simon can be blessed with the Love you and all those around you have to give!